Reserved until May 23 ? 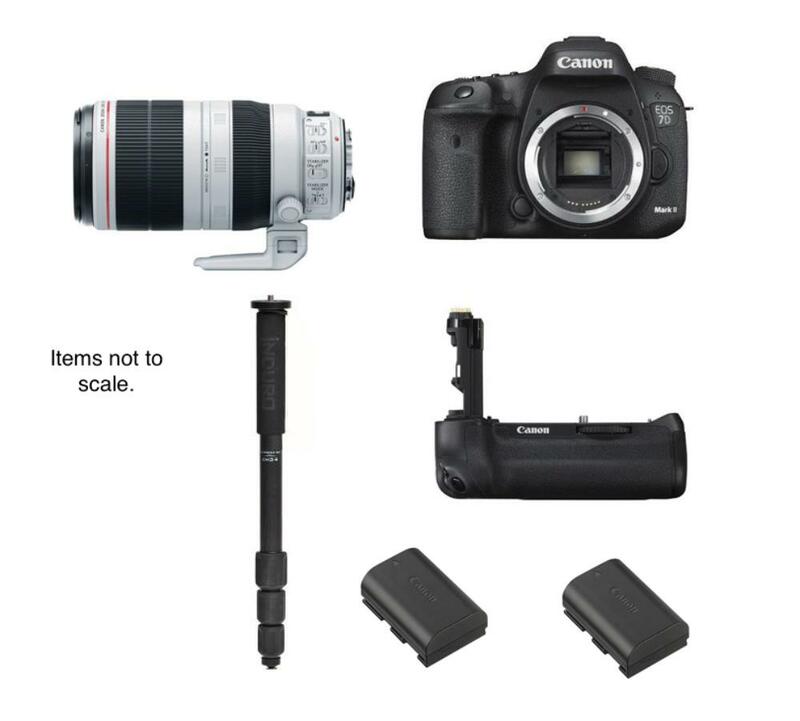 The Canon Field Sports Package is a lightweight and portable setup for outdoor sports where you are forced to stand far from the action. 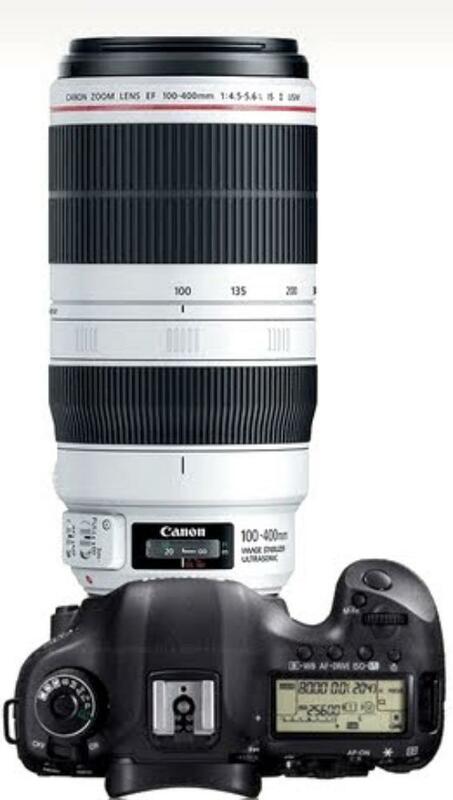 The f/4.5-5.6 maximum aperture of the 100-400mm is a bit too narrow for the low-light conditions of arena sports but is well-suited for daytime field sports. The sacrifice in aperture gains you a vast focal range in a very compact form factor so that you can shoot comfortably without obstructing anybody else's view of the action. When paired with the crop censor 7D Mark II, the 100-400mm gives you an effective focal range of 160-640mm, which is long enough to reach from center to end zone without changing lenses. The camera itself is quick – shooting at up to 10 FPS – so that you never miss a single play. The dual memory card slots are essential for overflow or as a fail safe when you write to one card and assign the other as backup for the first. Please note that memory cards are not included with this rental. It is recommended that you rent or purchase (1) CF card and (1) SD card with a 600-1000x write speed or a write speed of at least 95MB/s for maximum performance. Please refer to this chart for more details. The 7D Mark II is also weather resistant so that you can keep shooting in the rain. Included in this package is a battery grip that you can optionally attach to the bottom of your camera and double your battery life – allowing you to shoot for an entire game. The lens' rotating tripod collar attaches directly to a monopod, which provides enough support to keep you from fatiguing but is ultra portable and still gives you full mobility when you need to chase down the action. Simply rotate the collar to shoot in portrait orientation. The monopod is made from carbon fiber, so it is lightweight, and can be adjusted from about 1.5' to over 5' quickly with just a twist of the rubber locks. With this package, you get 1 in-camera LP-E6N and one spare for the battery grip (or just to have on-hand). The LP-E6N is a higher-powered version of the original LP-E6. If you happen to have LP-E6's, you can still use them with this camera. The N version is designed to accommodate the CPU and AF upgrades Canon put into the 7D Mark II. Overall, this is a simple but practical and robust package for anybody shooting track and field sports and is particularly ideal for school sports photographers, parents, and local sport journalists. It is also a fine setup for outdoor graduation ceremonies or any event you want to document when stuck back in the bleachers. It packs plenty of punch without the cumbersome load of a lot of sports-ready gear. • The 7D Mark II is a crop frame (APS-C) sensor camera and is compatible with both EF and EF-S mount lenses. When using full frame format lenses, your effective focal length is multiplied by 1.6x. • We make every attempt to have fully charged batteries for you but we can’t guarantee it 100%. If you need fully charged batteries, please request it via the order notes. • We cannot offer substitutions on packages. • Note that the included monopod does not include a tripod head. It is designed to be screw directly into the foot of the lens. If you want a tripod head, one must be rented separately. • Memory cards are not included with this rental. It is recommended that you rent or purchase (1) CF card and (1) SD card with a 600-1000x write speed or a write speed of at least 95MB/s for maximum performance. Please refer to this chart for more details.